There is a simple way to enhance every localization project. The use of statistical information in every single project will create positive outcomes to both the current and the future projects. Statistics and reports give valuable information regarding the project properties and current status. They are a great help for all the project participants. Learning = Statistics will make you understand the anatomy of a localization project. If you have never organized or participated in a localization project the statistics help you to see what resources are needed and how they should be allocated. Project by project you’ll learn to proactively recognise certain critical elements in a new project. Control = Knowledge is power also in localization projects. The PM can manage the project efficiently only if she knows how the project is proceeding. Planning = When a project is being planned, statistics and reports show the project properties numerically. This makes it easy to evaluate how much resources are required for each step. Whether you are a PM, a developer or a translator, you need to plan your work because the project success is up to every participant’s effort. Resource allocation = Statistics and reports help the resource allocation both before and during the project. 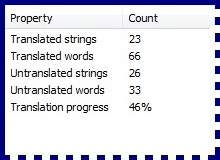 Translators see how many percentages of the translations are completed to estimate the required work effort for the rest of the project. By following the project progress the PM can easily see if the project is late for its schedule. Then the necessary corrective actions can be made early enough and total disasters are avoided. Budgeting = Money plays an important role in most localization projects. Statistics and reports are a straightforward tool to prioritise tasks and allocate the budget to the most critical steps first. Analyzing = Every professional project is followed by an analysis. Lessons learned are a valuable asset for the future projects. A new project is always a chance to improve and the analyses of previous projects help to form the best and worst practises. Do you use reports and statistics in your localization projects? Are these the main reasons or have you found other benefits of using them? Hi nice info on using statistics and reports in localization of a project! !